In 1990 the political struggle reached a new high with the elections to the Supreme Soviets of union republics and to local soviets. In the run-up to the local elections, the radical democratic movement in Russia adopted a new political strategy. Russian radicals came to the conclusion that it was futile to wait for the all-union bodies, including the USSR Congress of People’s Deputies and the USSR Supreme Soviet, to approve radical reform measures, as the resistance of their conservative memberships was too strong. Russian radicals were now determined to concentrate their efforts on taking power in Russia—the biggest of the republics—by winning the elections to the Congress of People’s Deputies of Russia. They would use their electoral victory to proclaim Russia’s sovereignty, then proceed to implement reforms, relying on the support of the more democratically inclined population of Russia. To this end, the radicals set up an electoral “Democratic Russia,” the core of which was comprised of members of the Interregional Group of Deputies. The elections in the union republics brought a resounding victory to radicals, of both democratic and nationalist persuasions. 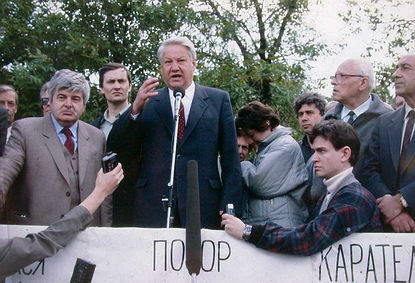 In Russia, Yeltsin became head of the Supreme Soviet, while his associates were now heads of the soviets in Russia’s two biggest cities, Moscow and Leningrad.